The hospital opened in 1971 as Fountain Valley Community Hospital, owned by a group of physicians with a desire to serve the community. Over the years, it expanded in many ways. In the 1980s, the hospital opened a 4-bed NICU and 8-bed PICU. In the 1990s, the Neonatal ICU expanded to 22 beds, the Pediatric ICU expanded to 11 beds, and the hospital added sub-ICU beds and a Bariatric Program. In 1994, the hospital was purchased by OrNda HealthCorp and then subsequently by Tenet Healthcare, its current owner, in 1996. The new hospital owners made further commitments to the community by adding a Telemetry Unit onto the 2nd floor of the Women & Children’s wing, opening a unit on the 4th floor of the East Tower, adding a Pediatric Playroom and Teen Room, renovating and adding advanced imaging equipment in the Breast Care and Imaging Centers, and updating the Outpatient GI Lab. In 2009-2010, the hospital held a grand opening for its new entrance with expanded lobby and waiting areas, an expanded ER lobby, triage and waiting area, added a 5-bed observation area, renovated cardiology and nuclear medicine areas and updated the OB post-partum and Labor/Delivery/Recovery rooms. 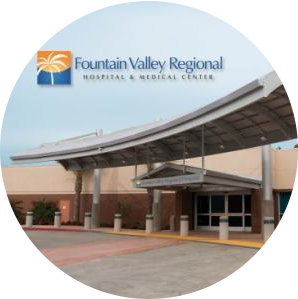 Today, Fountain Valley Regional Medical Center is a 400-bed, acute care facility with comprehensive services spanning from award-winning heart and stroke care, neonatal and pediatric intensive care, high-risk obstetrical services, bariatric surgery, and orthopedics, spine and neurosurgery. As one of the largest hospitals in Orange County and the largest employer in Fountain Valley, we're proud of our heritage as a caring, community hospital that strives to meet the needs of our neighbors by providing specialized services, skilled and caring physicians and staff, and a high level of quality care.